This control module is intended for use with waste water management systems. Its basic role is to monitor a level probe for a sign that the waste water in a storage tank has reached a defined level. 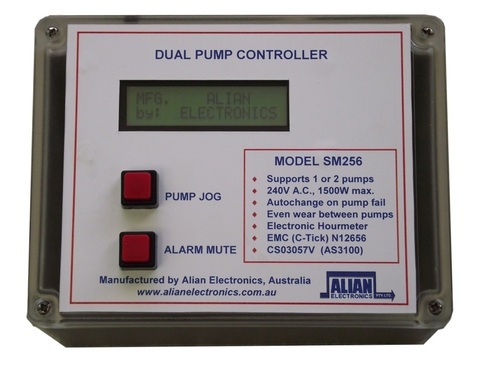 The controller responds by activating a pump until the waste water in the tank is reduced or removed. Where two pumps have been fitted, pump operation will alternate with each cycle. Where a second level probe detects a very high level in the tank, both pumps will be activated and a high level alarm will be triggered. A secondary feature of this system allows for an automatic spray wash down of the interior of the tank after an adjustable 1-6 hours after the last normal pump sequence. The control unit has several presettable options that may be engaged by the installer to suit a range of field installations. A Liquid Crystal Display (LCD) provides additional information about the status and operation of the unit. An internal Hour Meter may be viewed which tracks the number of hours and minutes that each pump has operated since the system was first installed. The module is 155 x 115mm. It is housed in an IP66 enclosure, 125 x 165 x 75mm, to keep it free of dust, moisture and to limit access by non-technical staff. A large LED and Piezo beeper are present on the board to signal overflow alarm conditions. A relay controlled 24V, 200ma AC outlet is provided via a 2-way terminal block, to drive an external spray solenoid. This is protected by a 1.5A, M205 style fuse. Each of the three power relays have an associated red ‘status’ led to indicate relay activity. A single red LED labeled ‘Power’ indicates that mains is connected to the unit. A 3-way terminal block provides the termination point for two momentary-action push button switches. One switch (JOG) will force a 30 second drain cycle of a pump. The other switch trips a 6-hour Alarm Mute timer which will block the sound of the audible alarm beeper for 6 hours during high-level and overflow conditions. Two option links labeled LK1 and LK2 may be placed into either an A or B position to select installation options. LK1 may be used to ‘Fast Forward’ several of the internal time delays to allow installers to test a system without having to wait for long time periods. LK2 may be used to force the controller into ‘Single Pump’ mode for situations where only one pump is available for use. A small, blue 10-position rotary selector switch is present to select one of several views on the display for the operator to monitor the system status and to adjust wash down spray delay times from 1 to 6 hours. Click on the link below to download this Product Information or the Operator Manual.